Congratulations on finding this book. You are one step closer to surviving an Ebola pandemic emergency. Hello, my name is Jake S. Alive. I wrote this book because I lost a distant family member to an infectious disease. She was only 6 years old and had her whole life ahead of her. She didn’t get a chance to grow up, make mistakes, fall in love, or start a family of her own. It was tragic and affected our entire family. Her death was COMPLETELY AVOIDABLE, and if only we had the information you have in this book, she may still have been here. 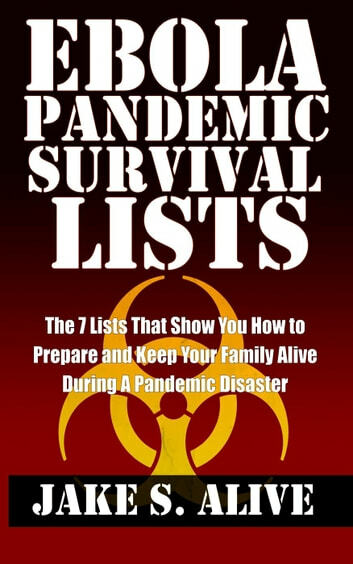 So now, I help people like you with and families like yours to get prepared using these seven crucial lists, so you have a better chance of surviving a pandemic disaster. 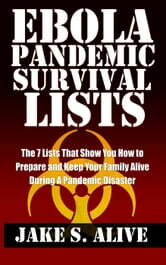 By reading this concise book, you will have the SEVEN LISTS that will show you what to prepare, so you can keep your family safe. And the key is you will have them in ONE place by purchasing this book. You just saved yourself numerous hours of searching over 22 emergency preparedness and survivalist websites to get this information. You’re welcome. So I’m writing this book to SAVE YOUR LIFE AND YOUR CHILDREN's LIVES. No one needs to get ill or die needlessly when we already know that Ebola is on U.S. soil. Your best defence is knowledge, preparation and you need to start now. Don’t wait until there’s chaos in the street, panic because of food shortages, and overall mayhem. BUY THE BOOK. Take some simple preparation steps now and give your loved ones a chance at a future after this first wave of Ebola. See you on the other side of disaster. The Sixth Extinction America: Part Thirteen – Abandon. A must read. Beginning with an overview of Ebola, the author presents valuable advice about our own preparedness.